Please meet Dudley (aka Daggot) - one of the many pound dogs that Rochdale Dog Rescue find rescue spaces for each year. Like most of the dogs we find spaces for, Dudley was found wandering as a stray, and we knew nothing of how he came to be abandoned and wandering the streets and have so many cuts on his face. No owner came forward to collect him and he was lucky enough to be offered a space by one of the lovely rescues that we work closely with. Upon arrival at the rescue he was taken to the vets and it was found that he had suffered an accident and he has a broken jaw and will have to have all his teeth out. Poor brave Dudley is such a good natured and friendly lad he had shown no sign of being in pain or having an injury. Dudley will need alot of care after his accident and his rescue will of course ensure he has the best care and all the vets treatment he needs. Many rescues are suffering at the moment due to the current credit crunch with donations falling and more dogs needing homes that money is always tight. We are running an appeal alongside his rescue to raise much needed funds to help with the considerable vets fees it will take to get him better so he can then find his forever home. If you would like to donate and follow his story please click on the link below to take you directly to the rescues website where you can click on the 'Donate' button. 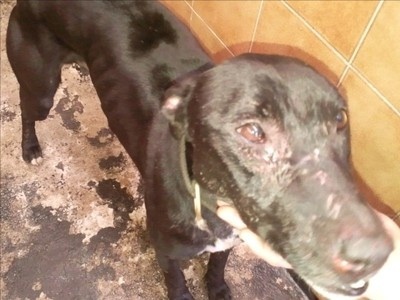 Please do state that you are donating via the Rochdale Dog Rescue appeal for Dudley.